Home → Blog → EASTER EGGS AND THE BABY BOOMERS. I was inspired to write this piece when Lorraine Tongs Clifford, from my hometown in Tasmania, posted the photo below. 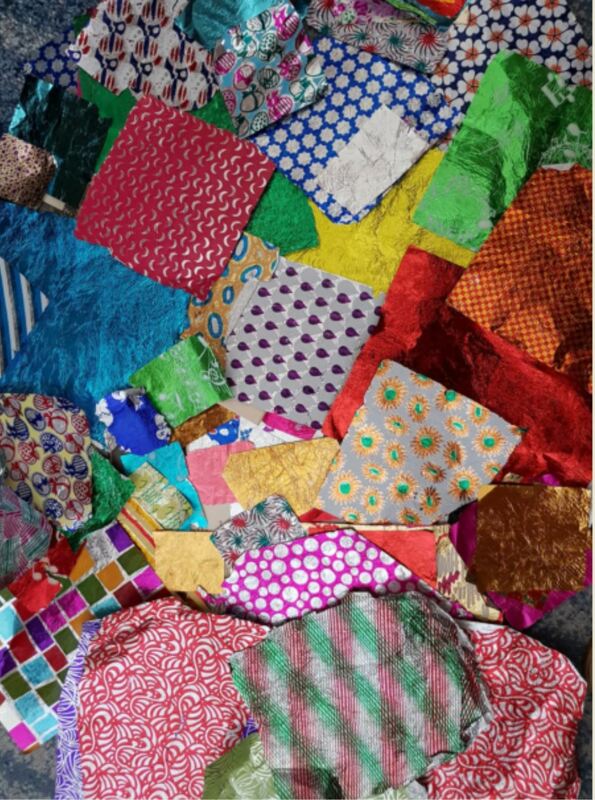 Amazingly, she had saved all her Easter egg foil wrappers from the 1950s. Oh my goodness, I was hit by a wave of nostalgia. I swear I could remember several of them on my own chocolate eggs. Oh the memories. Photo by Lorraine Tongs. My siblings and I carefully unwrapped ours and smoothed out the foil just as Lorraine did. However, we gave ours to our Grandma. She used the foil to wrap the stems of birthday posies, for the Methodist Ladies Guild in Ulverstone. Every year there would be newspaper photos of wide eyed children gazing into shop windows. There were no Easter egg hunts with buckets of goodies for us. Most kids I knew received the same sort of egg we did. They were about half the size of an Australian Rules football, and came with a dear little fluffy chick on top. Mind you, the egg advertised below would have been the one I lusted after, in fact I would still love one. They were advertised in an Adelaide newspaper. I wonder if anyone still has the furniture? 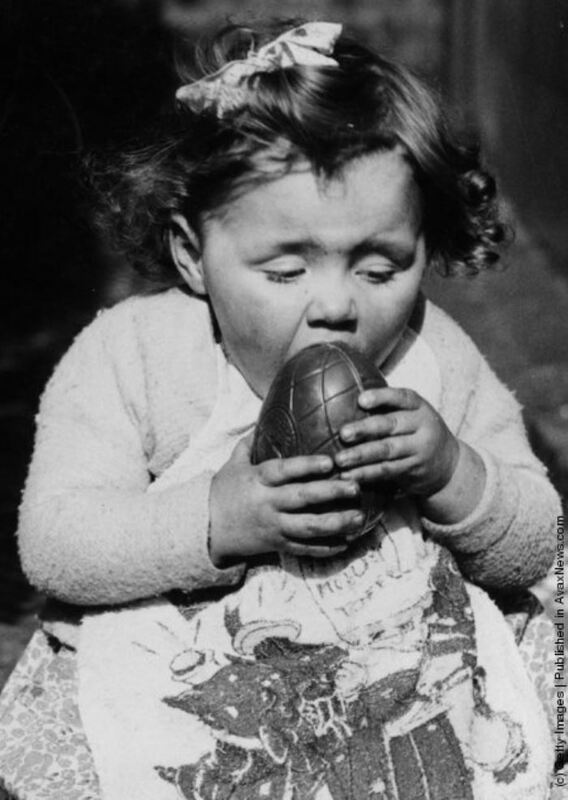 I adore the photo of this little girl chomping into her egg. We broke ours into pieces, which we kept in a glass for as long as we could manage. My sister Robbie was far better at saving hers, much to my annoyance. 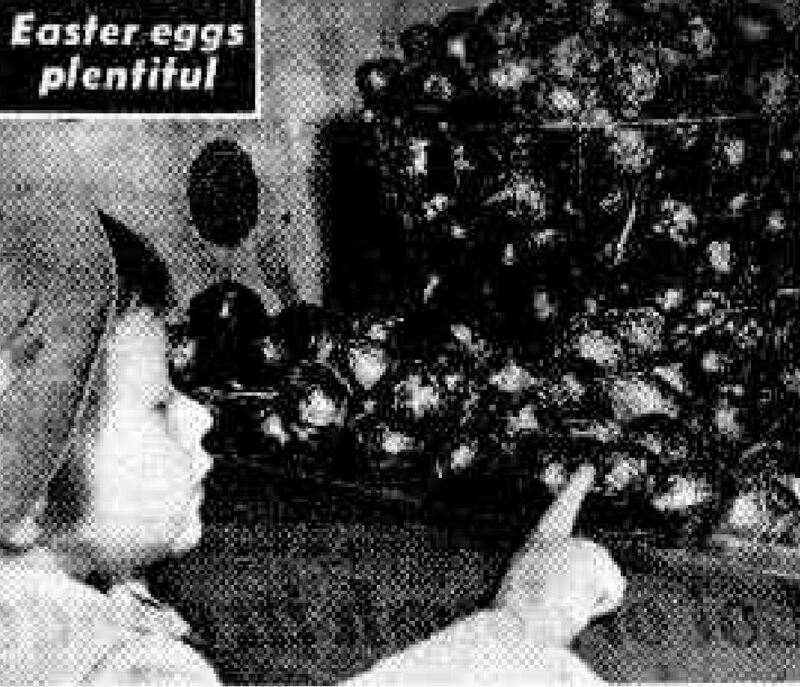 My most vivid memory of a non-chocolate egg is from my kindergarten year, in 1956. We painted empty eggshells and handed them to our teacher, Mrs Harris. 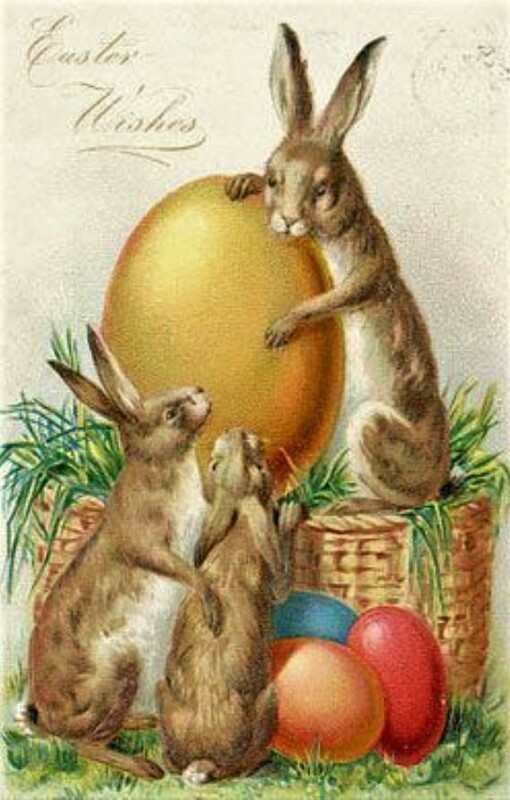 A few days later we followed strings and discovered the eggs in a basket, each filled with jellybeans. Oh the simple joy! The only religious person in our family was my Methodist grandmother. For the rest of us, Easter was more about family traditions, even though we were dutifully sent off to Sunday School. My mother always served fish on Good Friday and bought hot cross buns. I have wonderful memories of family dinners with lots of relatives, wearing white chrysanthemums on our lapels, and of course that magical visit from the Easter Bunny. 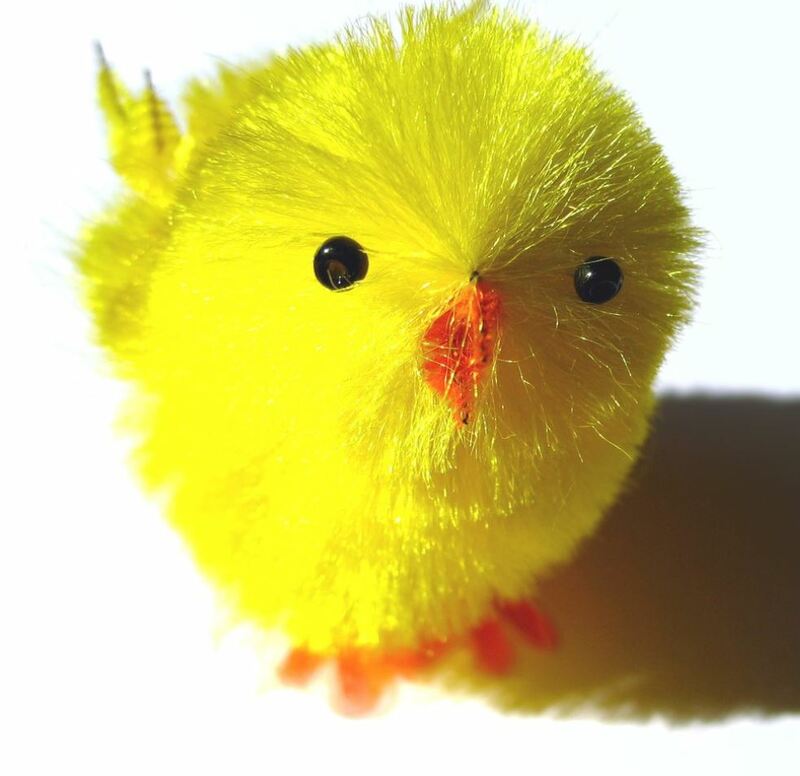 Happy Easter to all, especially to those who do celebrate its religious significance. Wishing you a Happy Easter, too, Pauline.